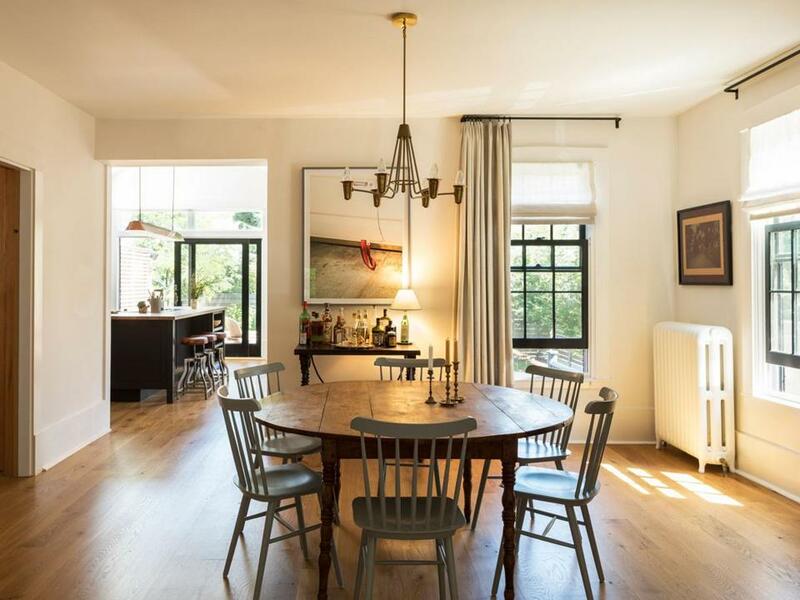 The founder of Intelligentsia Coffee wanted a lived-in and uplifting look. The exterior of the house is painted Farrow & Ball Black Blue, with Fine Paints of Europe Tulip Red on the door. Doug Zell wanted a house with a lived-in look, as effortless as it was uplifting. As anyone with an eye for design understands, a blend of simplicity and character is not easy to achieve. Unless you’re architect Barbara Bestor. Zell, cofounder of Chicago-based Intelligentsia Coffee and Allied Cycle Works, a carbon fiber bike maker in Arkansas, first worked with Bestor in 2007. He hired the Los Angeles-based architect, who grew up in Cambridge, to design an Intelligentsia Coffee bar in LA’s trendy Silver Lake neighborhood. Almost 10 years later, he asked Bestor to design the company’s Watertown outpost. 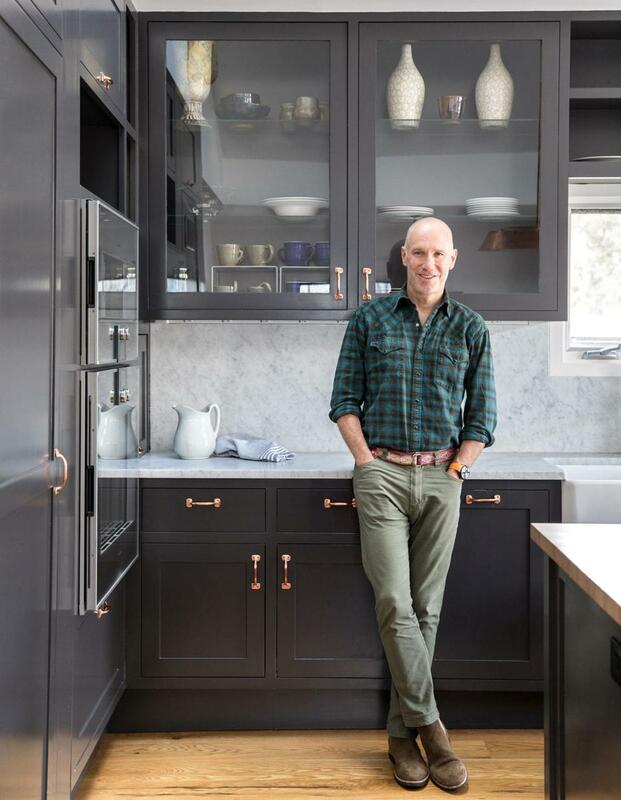 Entrepreneur Doug Zell in his Cambridge kitchen. 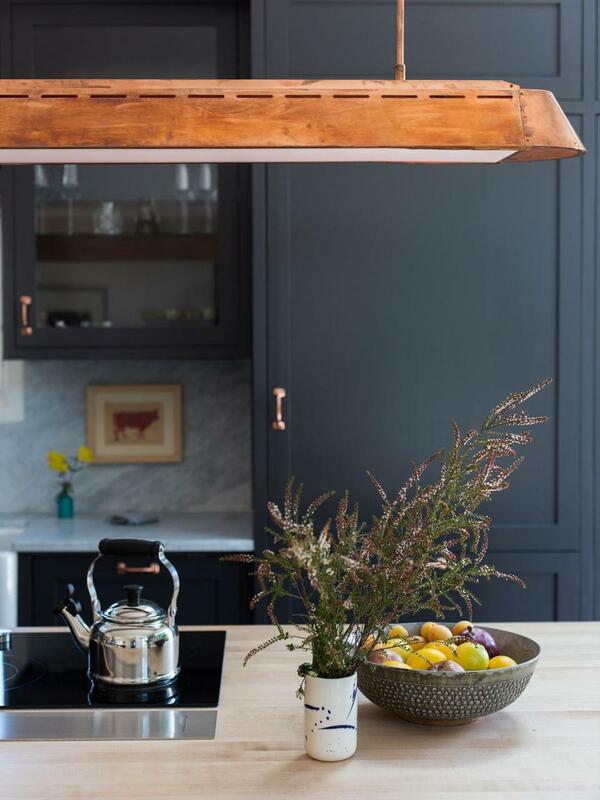 The cabinets are painted Dunn-Edwards Black Bean; the pulls are vintage window hardware. Inside is light and bright, with new oak floors and off-white walls. 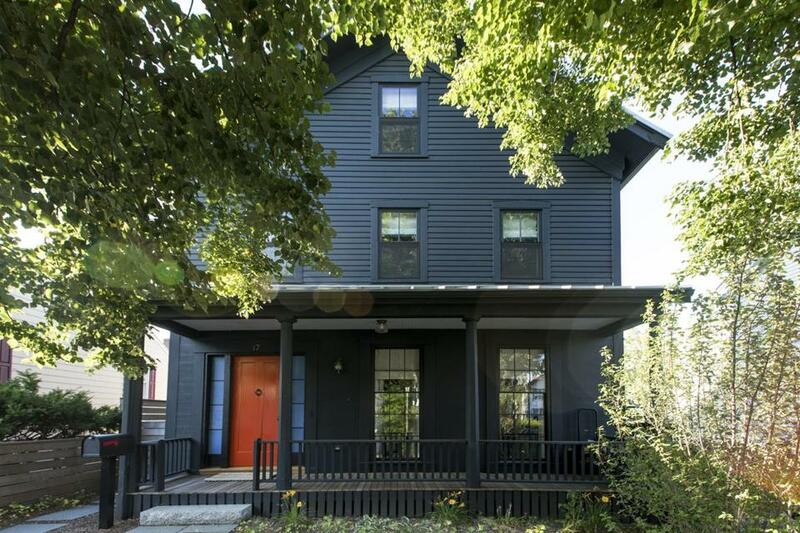 Black doors and window sashes provide contrast, and clean-lined pieces keep the eye moving. Bestor’s team handled the interior architecture and finishes, and brought in the bicoastal husband-and-wife designers Cy and Genevieve Carter to curate the furnishings. Cy Carter says, “We took the idea of an old Cambridge or London bachelor [pad], then flipped it on its ear, adding a punk rock vibe.” They drew on Zell’s love for mid-century modern as well as his attraction to the Japanese philosophy of wabi-sabi, which embraces imperfect beauty. “Worn materials are very much an ingredient,” says Carter. In the living room, an Italian mid-century brass-and-glass coffee table stores Zell’s collection of vintage games. The entry, with its tole umbrella stand, vintage runner, bench made out of a nesting box from a French chicken coop, and retro liquor poster, suits Zell’s taste with nary a frill. The living room is a tad more textured. 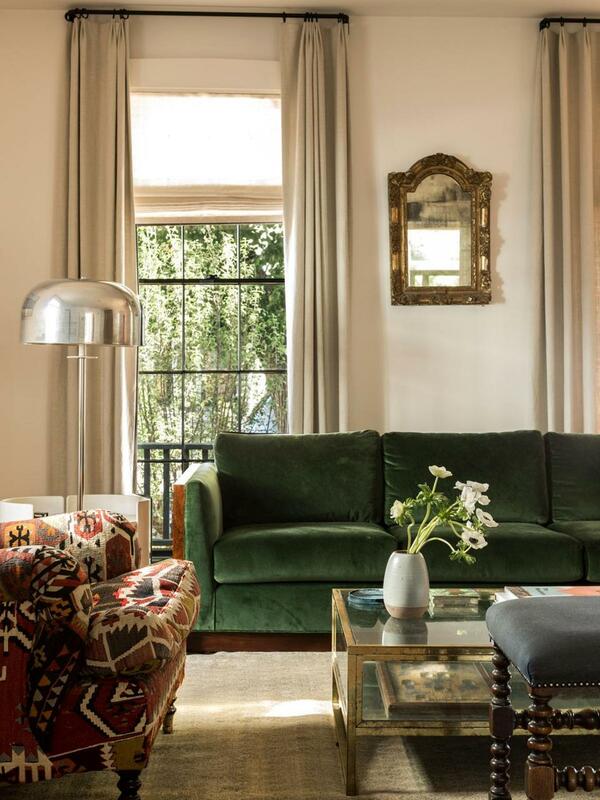 A Persian rug, a George Smith kilim chair, and dignified drapes offset a Milo Baughman rosewood case sofa from Machine Age in Dorchester, reupholstered in rich green velvet. The living room opens to the dining room, furnished simply with a 19th-century French elm table and Shaker-style chairs. Bestor widened the opening to the kitchen, where she added a custom oak banquette that Carter upholstered in cherry-red leather. She also raised the ceiling to a gabled peak, complete with skylights, and replaced French doors with a large slider that leads to a new deck, rectifying the home’s lack of connection to the outdoors. 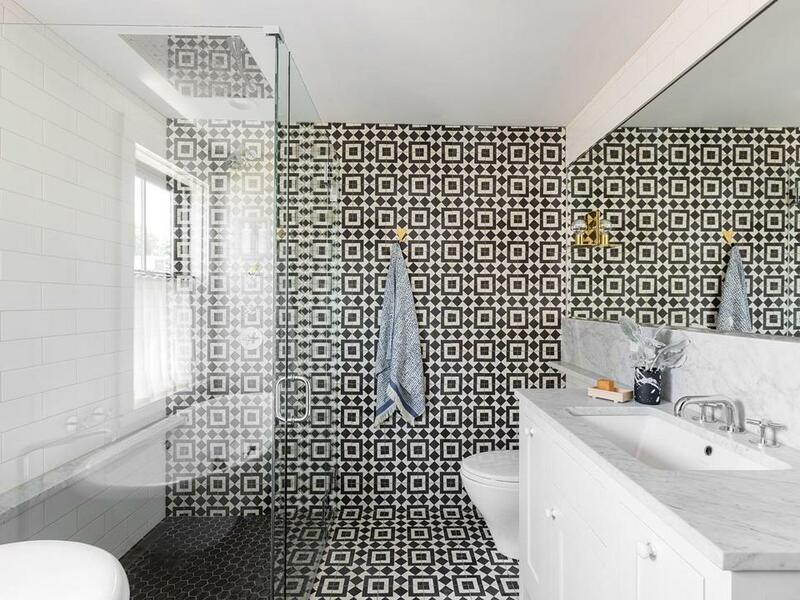 Slate-and-white Fez 928 tile by Granada Tile covers the floor and back wall of the master bath. The brass hooks are by Scout Regalia. 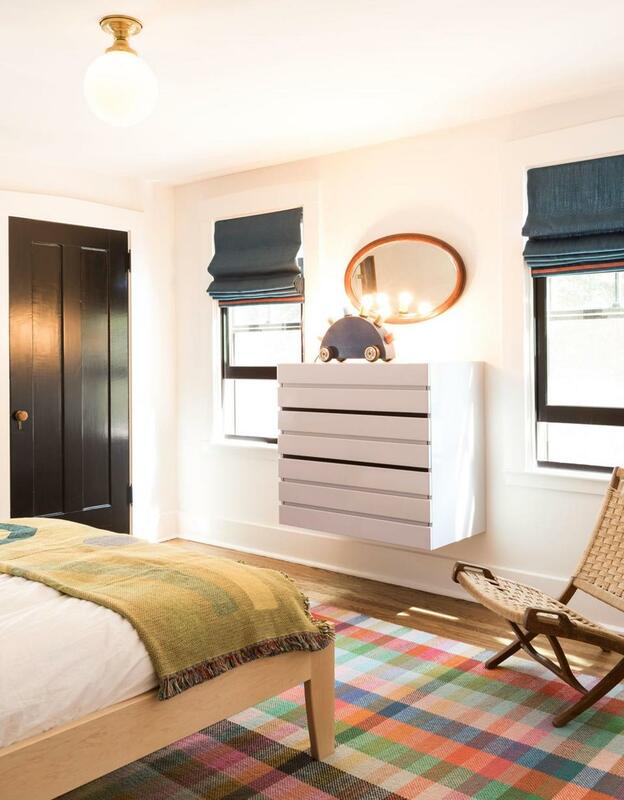 Cy Carter designed the Rietveld-inspired wall-mounted dresser in the guest room. Zell bought the John Maclean photograph that hangs over the antique console table in the dining room at Art Basel Miami. In the kitchen, the TL copper suspension light by Piet Hein Eek is from The Future Perfect.